Töpffer’s first published book Histoire de Mr. Jabot appeared in 1833 followed by Histoire de Mr. Crépin and Les Amours de Mr. Vieux Bois (or Histoire de Mr. Vieux Bois) in 1837. 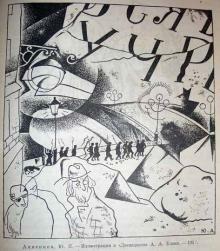 Bootlegs and redrawn fakes were numerous because of the popularity of his work, in particular by the Paris publisher Aubert. The first English language edition came in 1841, entitled The Adventures of Mr. Obadiah Oldbuck produced at Woone’s Gypsography, copied from Aubert’s unauthorized French edition. Robert Cruikshank did the English language title page. 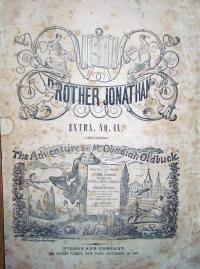 In 1842, this edition was reprinted in the United States as a supplement to the magazine Brother Jonathan. A painter, architect, and supervisor of Roman archaeology research, Raphael (1483-1520), was a leading figure of the Italian High Renaissance. In 1510, he was called to Rome by Pope Julius II to create frescos for a room in the Vatican. He returned at the invitation of Leo X to decorate the walls and ceilings of the Loggie, the Papal palace. Raphael’s elaborate plans included designs for 13 ceiling vaults, 52 ceiling frescoes predominately portraying Old Testament scenes, and 28 pilaster frescoes for the walls. Much of the actual work of was ultimately accomplished by his assistants. This project has come to be known as Raphael’s Bible. 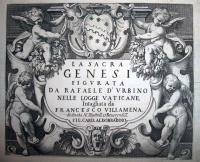 In the early years of the seventeenth century, the engraver Francesco Villamena reproduced Raphael’s biblical designs in 20 copper plate engravings (plus an engraved title page), published in at least three editions. The original prints of Princeton’s copy have been trimmed and glued to a new series of pages. The prints begin with “Confusam corporum molem Deus ex nihilo” (God creating heaven, Genesis i) and end with “Christus Dominus die tertia a mortuis resurgit” (The Resurrection, Matthew, xxviii). Also pictured here is “Diluuio totus terrarum orbis inundator” (The Deluge, Genesis vii). 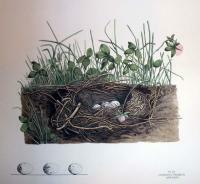 Illustrations of the Nests and Eggs of Birds of Ohio. Texts by Howard Jones and illustrations by Virginia Jones. (Circleville, Ohio, 1886). GAX 2008- in process. 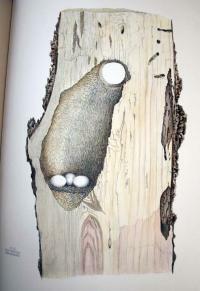 “Nest and Eggs” is a beautiful color-plate book that began in 1877 as the project of Genevieve Jones and Eliza Shulze, two young women in Circleville, Ohio. 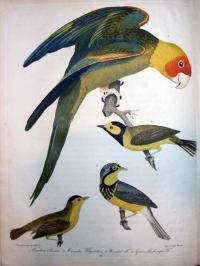 Jones’ father offered to finance the publication and to collect the birds’ nests for the girls to illustrate. None of them had any previous experience but it was their hope to produce a scientific work in twenty parts, illustrated with hand-colored lithographs, which would sell for $5.00/part. 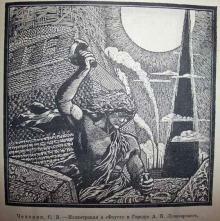 According to the research of Ernest Wessen, published in The Papers of the Bibliographical Society of America 47, no. 3 (1953), some of the production and most of the credit for the publication was taken over by Genevieve’s younger brother, Howard. Even their mother, Virginia, who help out after 1879, received more credit than her daughter. Regardless, the production of the book was exceptional. Adolph Krebs, a professional lithographer, shuttled 65 pound stones back and forth between Circleville and his studio in Cincinnati. 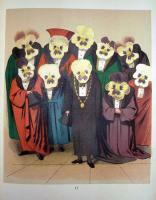 Josephine Klippart, a professional colorist, was paid $3/print. Robert Clarke, a Cincinnati publisher, printed the text and wrappers. 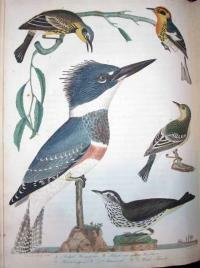 At the other end of the spectrum, is Alexander Wilson’s color-plate book American Ornithology, published from 1808 to 1825. Under the instructions of his neighbor, the naturalist William Bartram, Wilson began painting birds of the area. Engraver Alexander Lawson was employed to translate the designs to engravings. Either dissatisfaction or lack of funds led Wilson to fire the colorists and he did most of the hand-coloring himself. In a recent exhibition at the Library Company of Philadelphia, curators presented the discovery that Wilson also used some color printing to supplement the hand work. 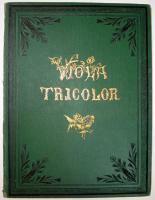 If this is the case, Wilson’s Ornithology is the first American book with plates printed in more than one color. Princeton University alumnus Brody Neuenschwander, class of 1981, has a new book, Textasy (Ghent: Toohcsmi, 2007), which is reviewed in the most recent issue of baseline magazine (Paul Shaw, “The Work of Brody Neuenschwander,” baseline 53 (autumn 2007) Firestone Oversize Z250 .B37q). The book is in process and will be housed in Marquand Library. Born in Houston 1958, Neuenschwander was appointed University Scholar while at Princeton, a position that allowed him to devote almost all his time (when he wasn’t rowing) to art history. He graduated in 1981 with high honors for his thesis on the techniques of medieval manuscript illumination. 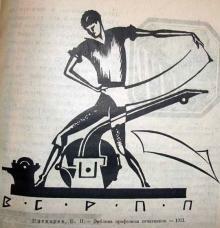 His graduate work was completed at the Courtauld Institute in London, writing on the methodology of German art history. More importantly, while in London, Neuenschwander began studying calligraphy at the Roedhampton Institute. 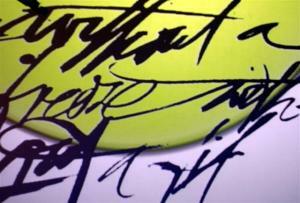 It was as a calligrapher, rather than an art historian, that he made a career for himself. This spring, we are celebrating the fiftieth anniversary of À toute épreuve, one of the most beautiful books of the twentieth century, created by the French poet Paul Éluard and the Catalan artist Joan Miró. The entire unbound volume is on exhibit in the Milberg Gallery for the Graphic Arts, Firestone Library, through June 29, 2008. The exhibition opening will be celebrated on Sunday, March 9, 2008, with Elza Adamowicz, Professor of French and Visual Culture, School of Modern Languages, Queen Mary, University of London, presenting the talk “The Surrealist Artist’s Book: Beyond the Page” in the Betts Auditorium, School of Architecture, at 3:00. A reception will follow at 4:00, in the Leonard L. Milberg Gallery for the Graphic Arts on the second floor of Firestone Library. From its humble beginnings in 1930 as a plain paper miniature, this simple collection of poems was transformed into an extraordinary deluxe edition folio. The cries of loneliness expressed in Éluard’s verse, “Je suis seul je suis seul tout seul” (I am alone I am alone all alone), are answered on each page with the buoyant companionship of vibrantly colored prints, resulting in a new sense of wholeness and optimism. The title of the work, roughly translatable as “ready for anything” or “foolproof,” conveys a sense of durability and perseverance. Éluard’s poems represent strength in the face of emotional turmoil just as the book survived production challenges and setbacks to become a monument to the art of bookmaking and the possibilities of collaboration. The project began in 1947, when the Swiss publisher Gérald Cramer approached Éluard with the idea of publishing an illustrated edition of his poetry. For the art, Éluard suggested his friend Miró, with whom he had already collaborated. It took Miró eleven years to create the 233 blocks needed to print 79 woodcuts. He used planks of wood collaged with plastic, wire, old engravings and bark paper to achieve images that practically dance across the page. “I am completely absorbed by the damn book,” wrote Miró to his publisher, Gerald Cramer, “I hope to create something sensational… .” The final volume has a brilliance of invention and a vitality of form and color, rarely found inside the cover of a book. Four large colonial prospects, or prospectus views, were engraved at various times during the pre-revolutionary era in the United States. The view of New York was first, then Boston, Charleston, and finally Philadelphia. Each includes a bustling river view with the major architectural landmarks depicted in considerable detail. Although they look similar, they have different artists, printers, and publishers, and do not constitute a set. South Prospect of New York was designed by William Burgis, engraved in London by John Harris, and issued in 1717. The final print measured over six feet in length, printed from four separate copper plates. The harbor is seen from Brooklyn Heights and might better be called a southeast prospect. The occassion depicted is thought to be a celebration of King George’s birthday. Burgis’s print was reissued in 1746 by London printseller Thomas Bakewell, with an updating of the skyline. In 1761, the Bakewell reissue was once again revised and re-engraved in a reduced format for the Auguat 1761 issue of London Magazine. This is the print we hold at Princeton, seen above. In October of that same year, London Magazine printed a prospect of Philadelphia. The original was designed by George Heap in 1754 in the style of William Burgis, but Heap fell ill and died before it was completed. The surveyor for the project, Nicholas Scull, had the engraving finished in London by Gerard Vandergucht. This view measured over seven feet, out-doing Burgis by a foot. A smaller version was completed by Vandergucht in 1755, which included a small section of the Jersey shore in the foreground. A number of variations of the Scull and Heap view exist, usually based on the second second state. 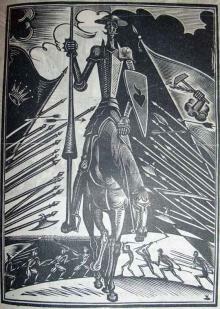 Princeton’s copy, published by London Magazine, was a gift of Alfred E. Kay, class of 1912. Chuck Close. Self-Portrait (anamorphic), 2007. Publisher: Two Palms. Edition: 4/20. Engraving with embossment on black Twinrocker handmade paper, mounted on wooden box/platform, with polished stainless steel cylinder. 24 x 24 x 12 inches. Printer: Douglas Volle. Acrylic printing plate: David Lasry. GA 2008. One optical technique is the anamorphic or distorted image, meant to be understood only when viewed at an acute angle or through a reflective cylinder. Some well-known examples of anamorphosis in art are the drawings in Leonardo da Vinci’s notebooks or the skull in the foreground of Hans Holbein the Younger’s painting The Ambassadors (1533, National Gallery, London). More recent examples can be seen painted on the stairs leading up to the Philadelphia Museum of Art or the stairs leading out of Pennsylvania Station in New York City. Close divided the photograph into sections and painted each section abstractly and yet, when viewed at a distance the image reads as a realistic portrait. 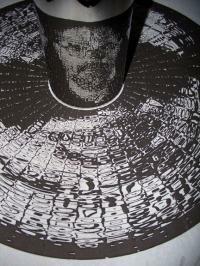 Then, a set of these portraits was distorted into a circular pattern, which was engraved by laser onto an acrylic plate. Once inked, the plate was pressed into hand-made paper using an overhead hydraulic press that can exert up to 750 tons of vertical pressure evenly on the paper and plate. 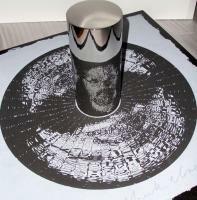 The final image can only be seen realistically through a polished cylinder placed in the center of the design. The graphic arts division at Princeton holds a wonderful collection of optical devices together with a collection of the optical prints and photographs to be used with each device. 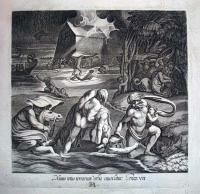 A small selection is currently on view on the second floor of Rare Books and Special Collections, Firestone Library. A New Translation of Jayadeva's "Gita-Govinda"
The Gita Govinda or Song of Krishna is considered by many experts to be among the finest examples of Sanskrit poetry. It was written in the 12th century by the great poet, Jayadeva, and describes the relationship between the Krishna and his lover, Radha. The poetry is organized into 12 cantos or chapters, each sub-divided into 24 divisions called Prabandhas, containing couplets grouped into 8, called Ashtapadis. The first English translation of Jayadeva’s 1000-year-old songs was by Sir William Jones in 1792. This new translation was completed by the contemporary poet, Andrew Schelling, who selected 29 poems from the 12 cantos to create a suite of poetic images of desire and longing, embracing both introspection and eroticism. Printed at emdash Press, Kamini employs 20 colors to capture the various blue manifestations of Krishna. The text is printed in English and Sanskrit, hand-set in Dante type on Bugra paper. 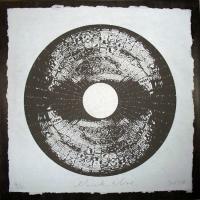 The images, photographed by Ken Botnick last spring during a trip to India on a Fulbright grant, were transfered to photo-polymer plates and printed with the letterpress text. Botnick is professor of visual communications and director of the Nancy Spirtas Kranzberg Studio for the Illustrated Book, at Washington University in St. Louis. 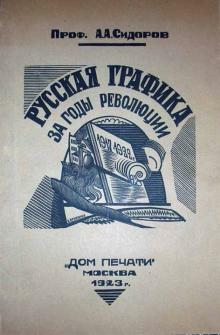 He is also the director, designer, and master printer of emdash Press. His career began at the University of Wisconsin, where his classmate Steve Miller had just launched Red Ozier Press. In the fall of 1979, Miller and Botnick received an NEH grant and moved the press New York City, where it ran successfully until 1988. Miller went to the University of Alabama as director of book arts, while Botnick joined Yale University Press as head of art book design and production. In 1997, he moved to St. Louis and Washington University. Graphic Arts holds a number of Red Ozier editions and two other recent emdash books: Kavya (2003), a series of classical Sanskrit poems collected by Octavio Paz; and In Defense of the Book (2001) by William Gass. These wonderful books are available, without appointment, in the Department of Rare Books and Special Collection reading room. Franz Pocci, a high official in the Court of King Ludwig I, was also a musician, artist, and writer. He collaborated with “Papa Schimid”, founder of the Munich marionette theater, designing and painting the sets, curtains, and props, as well as writing a number of the stories. 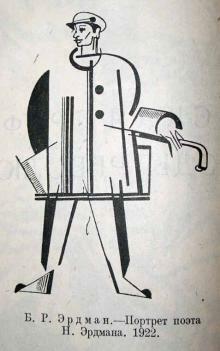 Pocci went on to publish many illustrated children’s books, which can be found in the Cotsen Library and the Graphic Arts division here at Princeton. In Viola tricolor, printed in astonishing chromolithography, Pocci replaces all the faces with flowers. He is responsible for both the art and the verse.